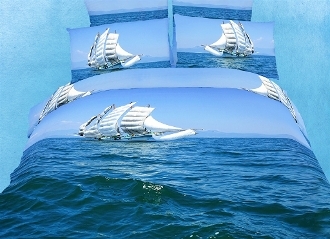 Bring happiness and youth in your bedroom with the beauty of the Bon Voyage bedding design. The vivid print of a Sail Boat sailing on the Caribbean blue waves will transform your bedroom into magical marine scenery. Dolce Mela bedding sets are crafted with State of the Art reactive printing plates, natural plant dyes and exclusive art designs with vibrant long lasting colors. • 4/6 Piece Luxury Duvet Cover Set Bed in a Box with Reversible Design. • Fits Twin XL Full/Queen size mattress up to 16 inches tall.